Happy Cinco de Mayo, everyone!! Hope everyone had a terrific weekend. We had a Pool Opening Party on Saturday, except the pool temperature was still too chilly for us to get in! (although, Mr. did jump in two weeks ago to fix the pool light, brr!) But at least the weather was perfect for the get-together! 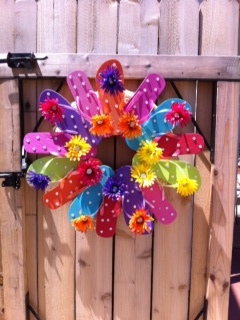 I made this flip flop wreath for the party to hang on the gate. Really easy and sooo colorful! Mix the 1st six ingredients together. Spread into a greased 2 quart baking dish. Mix the bread crumbs, 1/2 cup Parmesan cheese, and butter together. Sprinkle over top of dip. Bake at 375 degrees for 20 minutes or until top is brown and bubbly. Hope y’all enjoy it as much as we do! Y’all have a good week. This entry was posted in Recipes, Uncategorized and tagged crafts, flip flop wreath, Happy Cinco de Mayo, Jalapeno Popper, pool party, recipes. Bookmark the permalink. ← Tick Tock, Tick Tock!